Another great write-up in Zone4 Magazine this season. Did you see us at First Security Bank in Bozeman? Sage Gardeners was proud to display their garden beds, tools, photos, and work in the downtown First Security Bank window last week. It looked great and so many people stopped to chat with Jonquil while she was putting it all together. A big thank you goes to Insty-Prints for their generous support! 4% Day at the Bozeman Community Co-op on July 27th! Sage Gardeners was awarded with a Co-op 4% Day Grant! The 2012 month of July at the Co-op will feature Sage Gardeners as their monthly recipient - Sage Gardeners will have materials on display throughout the month of July! Please visit the Co-op and Sage Gardeners at their West Main Street location on July 27th... 4% of proceeds will be donated to Sage Gardeners. 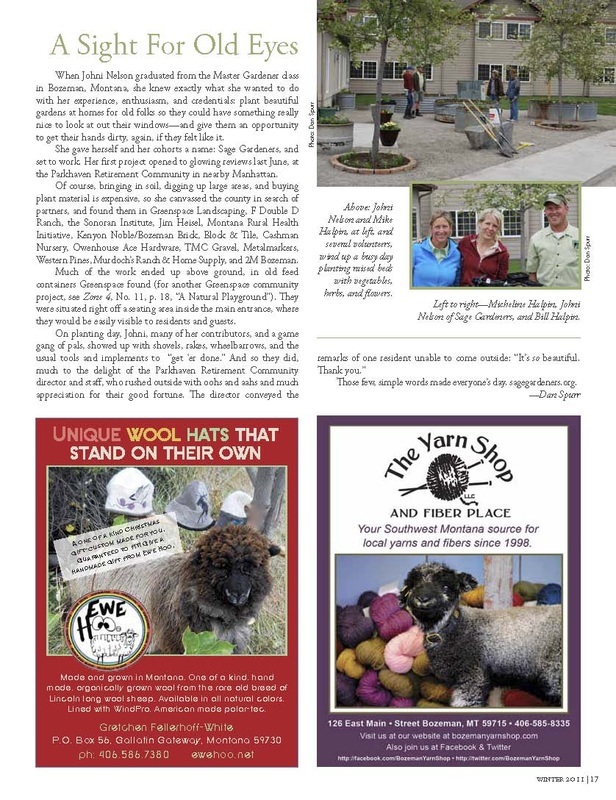 Save your shopping for July 27th and visit Sage Gardeners! Your support will go the distance and will directly benefit senior gardening in Gallatin County! See you on Friday, July 27th... stop by our table to say hello! ERIK PETERSEN/CHRONICLE Katie Reese plants a banana pepper at the Parkhaven Retirement and Assisted Living Community Friday morning as she and other volunteers with Sage Gardeners prepare several raised bed flower and vegetable gardens for residents to enjoy. Posted: Saturday, June 4, 2011 12:15 am | Updated: 11:37 pm, Fri Jun 3, 2011. MANHATTAN - On an overcast but calm morning at the Parkhaven Retirement Home Friday, volunteers were getting some dirt under their fingernails in hopes that residents here will do the same this summer. Some paced back and forth with shovels full of dirt, filling metal bins that came up to a standing man's waist. Others planted flowers, herbs and vegetables in the raised beds. By elevating the gardens, the volunteers for local nonprofit Sage Gardeners could ensure that folks in wheelchairs will be able to enjoy the new gardens. And by planting tomatoes, peppers and sage, the volunteers hope the residents will be able to taste the fruits of their labors. "We are putting these gardens in, mostly vegetables, so they can bring them home and eat them," said Jonquil Nelson, founder and executive director of Sage Gardens. "There are so many gardening programs geared toward kids. For seniors, it seemed like a no-brainer. They've been doing this their whole lives." Nelson started the group a year ago, and until Friday had spent her time gathering support and volunteers. But on Friday, the first of what she hopes to be many projects this summer was quickly coming together. "We've had a great showing of support," she said. 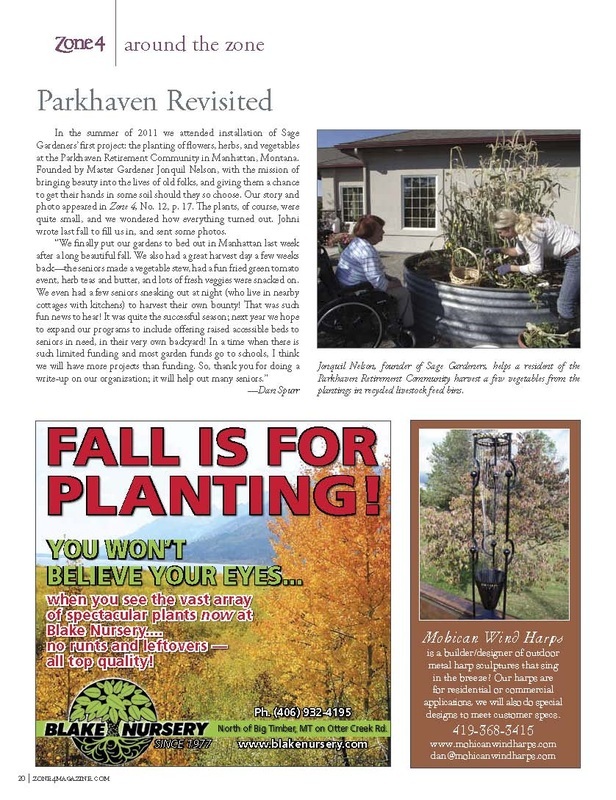 Chilly weather kept the residents of Parkhaven inside Friday morning, but activities director Leia Miller said she was certain the garden is going to be much appreciated. "They're going to come out, check it out, see what's coming up, give us advice," she said with a laugh. "It's a great conversation starter. It's good for the senses and it gets them outside." Nelson said her group hopes to place gardens at every retirement home in the valley. For more information on the Sage Gardeners, visit its website at www.sagegardeners.org. Daniel Person can be reached at dperson@dailychronicle.com or 582-2665.